Happy New Year, dear readers! I hope you’re off to a great start in 2012. 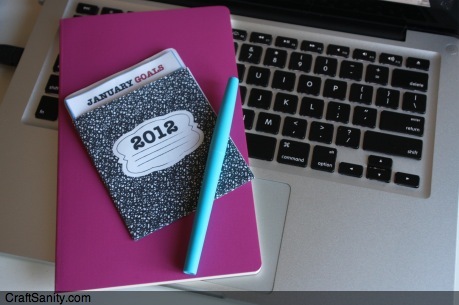 Today my newspaper column is about how list-making can help you obtain your goals in 2012. You can check it out here and then you can contribute to the conversation over here. I’m wrapping up work on next week’s column tonight. After that, I will only have three more left to write before my contract ends with the newspaper. It’s kind of surreal to think that my newspaper days will be over soon. I’m sad that newspapers across the country appear to be dying and I’m disappointed that I won’t be able to write about everyone I’d like to feature in the remaining weeks. But in the end I’m so grateful to have had this opportunity. It has been such a pleasure to get to meet and write about so many talented artists and crafters in West Michigan and beyond. I’m considering a plan to continue write the column on this website. If there’s enough reader interest and I can find some sponsors, I just might do that. If you have an opinion on this, let me know what you think. I got up early and went out for a 4.38 mile run before snow started falling in West Michigan. This was day 3 of my mission to get back into competition mode. I’d like to do a few races this year, so I’m working to build up my milage and endurance. Many of my runs lately have been to a farm near my house and back. It’s hilly both ways, but I really get inspired by the sight of that big red barn and therefore willing to run a couple miles to get to see it on a regular basis. While I’m running toward the farm I often daydream about what crops I would grow if I had land of my own and what it would be like to drive a tractor while sporting a cowboy hat and blasting the “Footloose” soundtrack. (I seem to recall a tough guy tractor scene in that movie, but it’s been a while.) How much land would I need to plant apple and peach trees, a massive strawberry patch, corn, grapes, multiple varieties of beans, tomatos, red pepers, cucumbers, onions, potatoes, sun flowers, and loads of other veggies and herbs? : ) I don’t have any idea because I don’t let myself get too bogged down in reality when it comes to my rather expensive farm dream. Even if I never get to live in a farm house with a wrap-around porch where I can sit in the porch swing on warm summer nights and watch the sun sink into the horizon while I sip strawberry lemonade and knit – I so enjoy thinking about this far-flung dream that I’ve made it a regular habit. I think everyone should have at least one of these sort of way-out-there dreams on their list. You know, the kind that are so fun to imagine that it doesn’t really matter whether or not it ever becomes a reality. Do you have a dream like that? Among my many plans for 2012, I’m looking to explore the wonderful world of cooking and baking this year and plan on taking a few notes along the way. 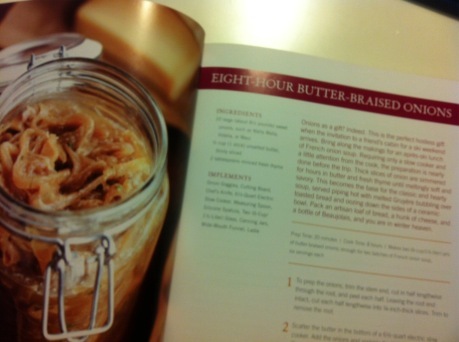 The first recipe that I tried today was for “8-Hour, Butter-Braised Onions” to make French onion soup. The recipe is on p.51 of “Gifts Cooks Love: Recipes for Giving” by Diane Morgan who was featured on episode #127 of the podcast. I don’t currently own any onion goggles and like to improvise as much as possible, so I wore my tinted swim goggles while I cut up the onions. (Just imagine someone doing this on a cooking show. Ha!) Amelia (sporting her swim goggles, too) helped me load the onions into the slow cooker in 2011 and they were ready to cool just after the ball dropped in Times Square. The instructions were to prepare the onions and divide them into two 1.5 liter (6 cup) glass canning jars to gift to a cook along with the soup prep recipe. However, I wanted to try out the recipe on my own family first so I just stored the onions in the fridge in a plastic container over night. As a onion lover, I thought the soup was delicious, however, my husband, Jeff, who is less infatuated with onions made a valid point when he noted that the presentation was slightly off-putting. This came after our daughters’ shared observation that the onions looked like worms dangling from our spoons. Okay, well, I may cut the onions smaller for the next batch that I plan to share with my dad who also loves onions. Either way, Jeff ate two bowls of soup and so did I. Despite the fact that our daughters gave it a thumbs down, I think it’s very tasty. Perhaps it takes kids a while to develop an appreciation for onions. I can’t remember when it kicked in for me or if I even liked onions as a small child. Do any of you have any fab recipes that you think I should try? Let me know if you do, ok?